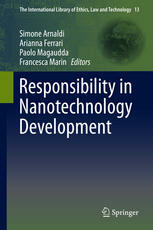 A new book edited by Simone Arnaldi, Arianna Ferrari, Paolo Magaudda and Francesca Marin for Springer that disentangles the complex meanings of “responsibility” in nanotechnology development.The volume disentangles the complex meanings of responsibility in nanotechnology development by focusing on its theoretical and empirical dimensions. The notion of responsibility is extremely diversified in the public discourse of nanoscale technologies. Addressed are major disciplinary perspectives working on nanotechnology, e.g. philosophy, sociology, and political science, as well as the major multidisciplinary areas relevant to the innovation process, e.g. technology assessment and ethics. Furthermore, the interplay between such expertises, disciplines, and research programmes in providing a multidisciplinary understanding of responsibility is emphasized. See a preview on the publisher’s web site. Download the index and contributors’ info. Part 2 Technology assessment and public engagement.- Technology assessment beyond toxicology – the case of nanomaterials; Torsten Fleischer, Jutta Jahnel, Stefanie B. Seitz.- Ethics Research Committees in reviewing nanotechnology clinical trials protocol; Viviana Daloiso, Antonio G. Spagnolo.-Governance of Nanotechnology: engagement and public participation; Giuseppe Pellegrini. Epilogue: Nanotechnology beyond nanotechnologies Responsible Research and Innovation: an emerging issue in research policy rooted in the debate on nanotechnology; Armin Grunwald.- Index.